After a couple of very oversaturated years where Omega has, for lack of a better term, over-focused on the Planet Ocean and Speedmaster lines (the running joke in 2015 was “50 shades of Planet Ocean”), the brand seems to have weirdly found their stride in 2018. Having been provided a walk-through of the latest additions to the collection, this is the first time in a good while where we’ve seen a well-balanced assortment of releases from the brand that wasn’t entirely focused on a single collection. Between the Speedmaster, the Seamaster, and even a handful of more dressy and vintage-inspired options, the brand has offered up a proper refresh for 2018 that delivers mass appeal from every corner of the brand’s collections. Of the wide array of new models on offer, here is a quick glimpse at some of the more significant standouts. 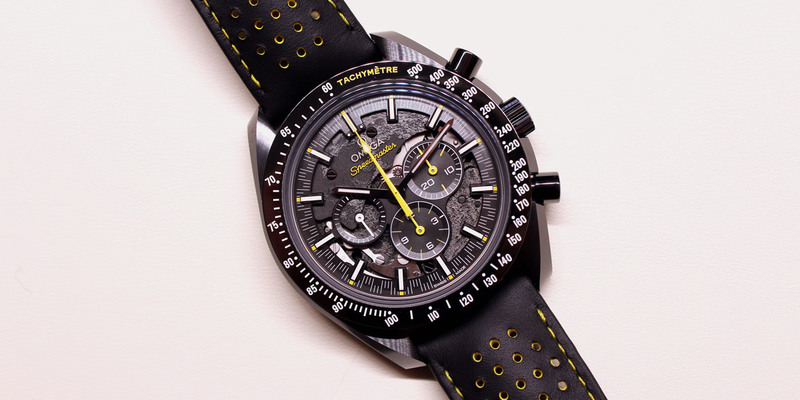 The Speedmaster Apollo 8 “Dark Side of the Moon” is a watch that stood out for us. While we love our collection of Omega Speedmasters this one really sets the tone for 2018. There have been quite a few Speedmasters of late that play off of the “moonwatch” theme in some form or fashion, though this new Apollo 8 is now poised to be the brand’s new must-have Speedy. For starters, a partly skeletonized dial featuring three-dimensional plated mimicking the surface of the moon provides a stark background to the new Speedy’s bright yellow chronograph hands. Measuring 44.25mm across, its diameter matches the many Co-Axial Speedmasters out there, but given the Moonwatch focus of this new release, Omega decided to equip this exceptional new piece with the Omega caliber 1869—a specially decorated version of the brand’s handwound caliber 1861. One of the key benefits of this hand-wound caliber is the fact that its case thickness has been trimmed down ever so slightly, coming in just over 13mm thick. Having worn a number of Co-Axial Speedmaster watches over the years, the biggest gripe I ever had was their pudgy case—a problem easily solved by this elegantly decorated handwound caliber. 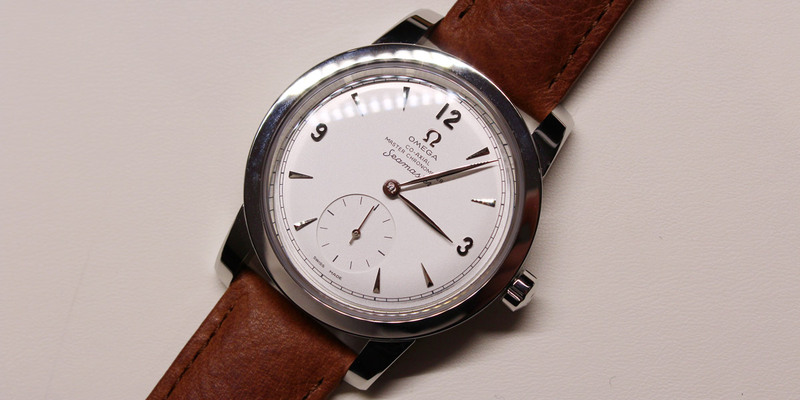 The Omega Seamaster is another iteration that got a lot of attention for its updates. 25 years after its initial launch, the Seamaster 300M has received another healthy refresh for 2018. Most notably as a jumping off point, its case size has been increased to 42mm, which on paper we thought might be a bit of a concern, however on-wrist the new pieces fit quite comfortably. Unlike the previous Seamasters worn by James Bond, this Seamaster 300M diver remains quite slim and trim in the grand scheme of things, and whether examining the new models on rubber or on bracelet, if anything the compact diver has opened itself up to a much broader market with its new proportions. Sizing aside, what really sets these new divers apart is Omega’s decision to craft its dials out of ceramic. To be fair, there has been a bit of a backlash about the broad wave pattern found on these latest Seamaster dials, however having seen them in person they’re quite a bit more appealing than one would think based on stock 2D images. In particular, the grey dialed variant with blue ceramic bezel is the hero piece by a landslide, unless you’re a two-tone fan, in which case the black-dialed variant with a gold bezel may quickly grab your attention. 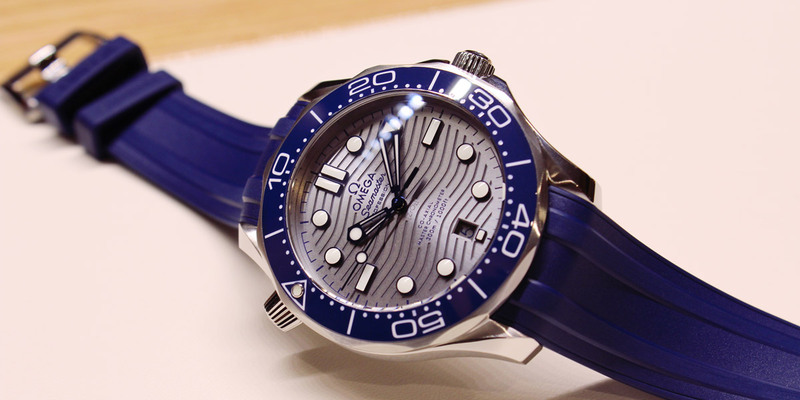 The Seamaster commemorates their 70 year anniversary with this homage. In the grand scheme of things, Omega has not been a brand to jump onto watch industry trend bandwagons all that much, though in the case of the Seamaster 1948, the brand is now offering a pair of very vintage-inspired dress watches that are destined to have significant mass appeal. Commemorating the 70th anniversary of the original Seamaster, early versions of the timepiece were destined for military service, and these faithful recreations come in two different variants including a model with central seconds, and a second with a small seconds subial at 6 o’clock. Measuring a modest 38mm across, both models feel properly vintage without feeling contrived (as can be the case with many “vintage inspired” pieces making their way onto the market these days. Both examples are offered with leather and NATO straps.